Since we are now in April and quite far from the March LEGO Technic Challenge, dedicated to the "Linear Movement", we can now talk about topics somehow related, without fearing to influence contest participations. So, lets take a look on the Stewart platform . Such devices allow the ability to move other devices mounted on their top, over six degrees of freedom (namely the three linear movements x, y, z and three rotation movements as pitch, roll and yaw). They are a kind of parallel robot or parallel manipulator, controlled by six prismatic actuators mounted in pairs, crossing over to three mounting points on a top plate. This platform was first designed and made operational by E. Gough in 1954 for industrial tire testing machines. Later it was described by D. Stewart (1965). Although commonly referred as "Stewart platform" it would be more correct and fair to call it "Gough/Stewart platform". Besides six prismatic actuators, the Stewart platform also includes one lower base platform and an upper payload platform. 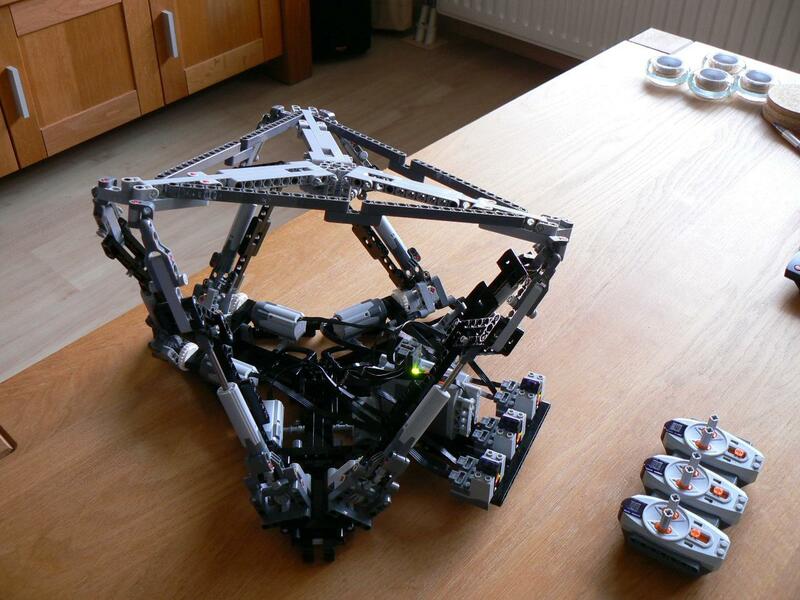 It also uses 6 spherical joints and 6 universal joints, connecting the prismatic actuators to the respective lower and upper platforms. Because of its complexity and difficulty to control, there have been several further developments looking for optimized geometries and easier control, however the original Gough/Stewart platform remains the most known and reproduced. The geometric restrictions that applies to this setup, requires that prismatic actuators must move in a combination of movements articulated to each other, so-called synergistic motion platform. The Stewart platform manipulator with its 6 DOF motion, is a complex system requiring deep knowledge on advanced mathematics in order to solve its equations and achieve full control of the platform. This is often refereed as inverse and forward kinematics, which applies also to other robotics domains and 3D computer animation techniques. In our case, the inverse kinematics are mathematics treating the problem of describing the position and orientation of the payload platform in terms of the actuator variables, i.e. all the six actuator lengths. The forward kinematics of Stewart platform determines the 6 DOF motions of the upper payload platform and the link length variables, which plays important role for the MIMO (multiple input and multiple output system) control or the motion visualization of the Stewart platform, but unfortunately it is difficult to come by because of the nonlinearity and complexity of the equations describing the system behavior. Hence difficult to achieve in realtime systems. Most common uses of Stewart platform devices appears in machine tool technology, satellite dish positioning, telescopes, surgery devices, etc. The Stewart platform design is extensively used in flight simulation, particularly in the so-called Full flight simulator for which all 6 DOF are required. Above the barman (barebos) prototype. This is probably the first LEGO realization of a Stewart platform. It seems to work quite smoothly, but most likely this was a carefully selected sequence of movements (on the actuators), that won't lead into noticeable mechanical constrains. The mechanical leverage that allows each actuator to extend the correspondent payload vertice, twice its own course, fits really nicely in a prototype like this. You may find some additional photos and details of this realization, from Barry's folder on Brickshelf. Here another Stewart platform realization. This one by Shep from Tinkernology blog. As he admitted the movements fluidity we see in this video are totally faked. In the sense he has found first some working positions with a regular remote, and then mimicked them programing one NXT connected to an IRLink sensor, from HT. By the time of the LEGO Technic Challenge raised last March, about "Linear Movement", there was a new set of Stewart platform experiments popping. As an example, this one by Laurens Gauwloos, had probably a strong inspiration from one of those above. However still worthy to mention. And finally on a much more simplistic note, this motorized flight simulator by Jovlem (not really a Stewart platorf at all), using just three small linear actuators. Really nice and effective realization, either from both technical, visual and demonstrative aspects. Such configuration eliminates all the problems with mechanical constraints from a real Stweart platform implementation, thus over simplifying its control. Of course it doesn't allow real 6 DOF movements, namely pure roll and yaw movements (that's why real systems use much more complex setups) but it perfectly serves the intended purpose. 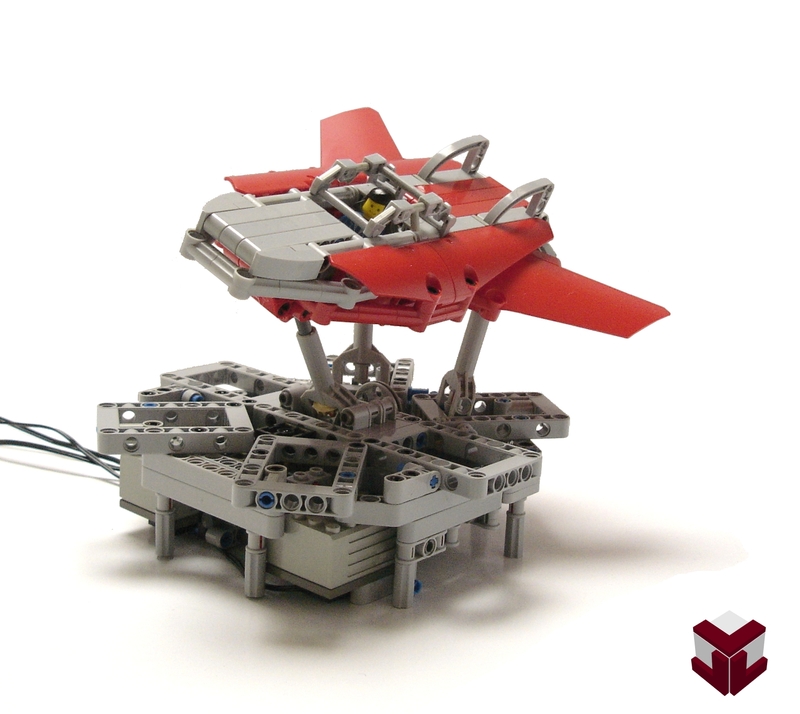 This was another entry to the LEGO Technic Challenge from March. You've done a good work with you simulator as well! Which benefit would you see making it like that? FK = "Given the angles at all of the robot's joints, what is the position of the hand?" IK = "Given the desired position of the robot's hand, what must be the angles at all of the robot's joints?" In this case, IK is the problem of finding the six actuator lengths, given a certain position and orientation of the platform. FK is the opposite. Strangely, in this case the IK are very easy to solve! Normally FK is easier to solve than IK, but this construction is an exception. If the desired position and orientation of the platform are known, the positions of the 6 upper pivot points can be found easily. The 6 lower pivot points are fixed, so their positions are known. The length of each actuator is just the distance between its 2 respective pivot points. Many IK problems require the use of a numerical method instead, so are more difficult to solve. Someone should make use of this with an NXT. This is a good application for variable pneumatics. I had the idea of driving some variable pneumatic stages from an NXT as a way to smooth out any incompatibilities of cylinder positions between the 6 actuators for the standard platform. The NXT specifying the positions of 3-6 DOF by its motors and the variable pneumatics being a set of servos to achieve the position in 6 DOF, with closed-loop control on the actuator positions. I have made some progress but there is a way to go yet!